What this at once ironic and somber wordplay has to teach us about the state of crisis in which we still live? Christmas and the New Year come and go, but the horizon of what is coming seems unfit to bring anything new. 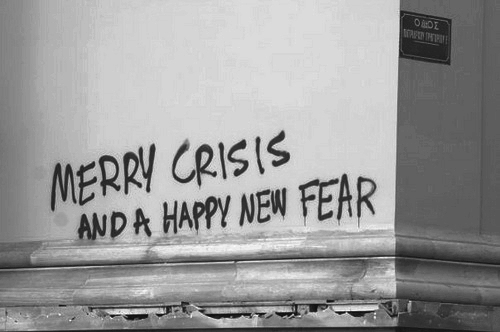 When the attempts at catching a glimpse of the future reveal only several modes of crisis, we must salute what is coming with the disturbing potency of a wordplay: "Merry Crisis and Happy New Fear". Crisis is a common theme in many attempts to understand the world in which we live. In the discourse of the powerful, mentioning "crisis" is often a way of justifying the persistence or the deepening of the unequalities which benefit them. In the discourse of journalism, "crisis" is the keyword which defines a growing number of editorial agendas: destruction of the natural environment, problems of urban life, globalized economy etc. There is nothing outside crisis, and it must be governed, they say. The way we experience crisis is not homogeneous. While the discourses about crisis seek to restrain its meanings within a more or less precise representation of its reach in space and time and of its socio-historical consequences, the 99% live through crisis as daily experience: it is common, trivial, effectively ungovernable. The 99% displace the dominant discourses about crisis by means of a series of attitudes of protest against the way crisis is governed. When the cover of Vavel magazine, in its 2007 Christmas special, featured the above photograph, of unknown authorship, perhaps the sentence it registered had not yet reached its current widespread dissemination. After that, indeed, "Merry Crisis and Happy New Fear" has become a sort of slogan of the manifestations which took over the streets of Greece in 2008, as well as an object of appropriation by the Occupy movements in many Western cities, which have commented on the sentence in their blog posts, reproduced and spread it in their own manifestations. To remember the words "Merry Crisis and Happy New Fear" and especially the uncountable images in which they have been made visible is an occasion for recalling that the crisis remains the common experience of the 99%, amid the oscillations of global economy, the transformations of urban landscapes and the consolidation of environmental consciousness as the privileged form of consciousness about destruction. Since Christmas and the New Year are getting closer, under the echoes of the protests which took over the streets of the main Brazilian cities in June 2013, amid the more and more explicit attempts at institutionalizing the indigenous genocide within Brazil, the wordplay of these words remains strong. Indeed, the world in which we live is still an inverted one.